​Those of you with the keenest of eyes may have observed that the above picture of Petr Cech is from his Chelsea days. If you hadn't, well, know that it is. That is because, just like Frank Lampard at Manchester City, John Terry at Aston Villa and Didier Drogba at Galatasaray (and others) - evoking the spirit of Michael Jordan at the Washington Wizards - Arsenal will always be an afterthought following his retirement. Sure, there are moments to marvel at - there always will be with such transcendant players - but they only serve as a reminder for what used to be, for a greater moment, performed on a bigger stage, with more astounding skill. "The like of which we’ll never see again". It’s a phrase that, like "legend" or "genius", is banded around with abandon these days, to the extent that explanations like this have become necessary before you launch into the cursory gushing over a genuinely worthy winner of such a label. But, be it legend, genius or the like of which we'll never see again, ​Petr Cech is certainly that. Though I'm hardly the best judge of goalkeeping technique, he was clearly at the upper echelons of every attribute required to be a quality shot-stopper. But this was not necessarily what made him so great. It was his bravery, and his quiet, unpretentious leadership skills that did that. He was never the bravado-displaying force of nature that say, Peter Schmeichel was for Manchester United, or Gianluigi Buffon was for Juventus, but he didn't need to be. Unlike someone whose whole game is predicated on this posturing, like Joe Hart, Cech was the opposite. He didn't have to overly berate, and unnecessarily huff and puff at his teammates, to back up his talent. This shouldn't be mistaken for a lack of passion, though. The Czech was a titan when he needed to be. In a team overladen with generational leaders, Cech cut through the noise with considered calculation and a generous spirit. The man with the "golden hands and heart" was Didier Drogba's "hero" for a reason. As the Ivorian continued in his ode to the keeper on Instagram: "Man saved three pens and run into me like I’m a legend." That simple sentence tells you everything you need to know about the player, but if you'd prefer a more eloquent version, you can have it. As cited by Chelsea's ​account, the striker has previously admitted: "Every time I see the trophy, every time I think of ​Chelsea winning the Champions League, it is for this man." Of course, it may seem defunct to cite European glory in an article claiming domestic dominance, but in so many ways that Champions League final was the crowning of Cech as the preeminent keeper of his time, and any time in the ​Premier League era. Because it's hard to consider Schmeichel's legacy, or Edwin van der Sar's, without glancing at their European exploits. Both had huge hands in European triumphs, but not quite like Cech. The pictures of him that night, trophy aloft, teammates encircled, verge on deification. Fernando Torres appears to be mid-worship. When all is said and done, it is the most affecting image from the whole night. But if that doesn't convince you of his status on these shores, then look no further than his staggering tally of 12 domestic trophies - four Premier Leagues, five FA Cups, three League Cups. That's three more than Schmeichel, seven more than Van der Sar. He has 34 more league clean sheets than anyone else in history, and four more saves (as it stands). His statistical and individual ​achievements are too numerous to name. Not many players would have the bravery to return to the game with the same desire and commitment following such a serious head injury. But Cech came back better than ever, enjoying his signature years adorned in that loveable scrum cap. The adjustment, both mentally and physically, to that additional requirement cannot be understated. Neither can the 36-year-old's quality. 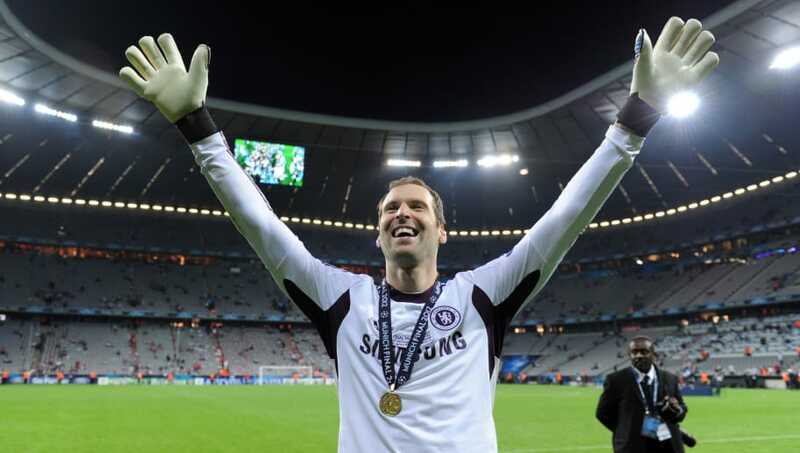 Enjoy your retirement, Petr. We will never see the like of you again.